Working on genealogy is a hobby and a very rewarding one. However, there are fun activities that complement this hobby. First, would be making a special exhibit of your newly created family tree. It may not be completed, but even with a small start, it makes a nice display. Many places in craft stores and online genealogy supply sites have array of tree displays to select from. Besides a printed chart of the family tree, you could be creativity and make a family tree onto a quilt for everyone to enjoy. Start looking at online auction sites like ‘eBay’ http://www.ebay.com . In their search box, put in an ancestor’s name, place quotes around it, then see if anything comes up. Try variations on the surname. Put in the ancestral hometown name, again in various forms like; ‘Haverhill, MA’ and ‘Haverhill, Massachusetts’ to get the best selection of listings. You never know when a postcard, ancestor’s business card, even a photo can come up for auction. Some other possible items up for auction can include; a journal, a family Bible, needlepoint sampler, cookbooks, journals or scrapbooks. Even if you do not win the auction, you have now seen the item and know that it does exist. On your first time attempt at a search and there is nothing available for sale, click on the ‘Add to Favorite Searches’ on the right side and a box will appear allowing you to request email messages be sent updating you on any new items matching your search criteria in the future. Most immigrants until more recent times arrived in Canada, United Kingdom, Australia, South Africa or the United States by ships. Another fun activity is to research more about the actual ship your ancestor arrived on. If you know the ship they traveled on, make sure to put that ship’s name into an Internet search engine, like ‘Google.’ Besides postcards and photo images of the ship, there could be passenger lists, ship menus, souvenir spoons, or printed advertisements for trans-Atlantic crossings approximately the same time your ancestors came across. A collection of the images of the ship and any items related to that ship adds a special touch to your genealogy. If any ancestor was part of a war; the American Civil War, World War One, the Boar War, etc. learning all you can on the events during that war and especially any notable battle the ancestor participated in, is very interesting to explore. Collection of articles, books, drawings, stories, images of those military battles can really shed new light on your own ancestor’s experiences. Any ancestor held as a prisoner-of-war opens another theme which could prove to be fascinating. 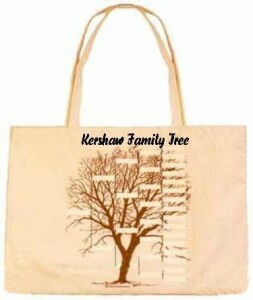 A special item to make or purchase is a tote bag with a genealogical saying is an enjoyable pursuit. There are many cute sayings that can best express you with your research.